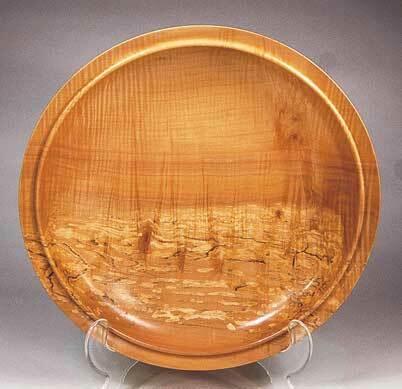 Oil finishes are considered by many turners to be the holy grail of woodturning finishes. Among the easiest of all finishes to apply, they impart a sensual 'close to the wood' feeling that begs to be touched and caressed. In my demonstrations around the United States and in discussions with other turners over the Internet, no other subject has spawned more questions than finishing. In the past, it was considered an art form, with the procedures and formulas jealously guarded by craft guilds. Today, few turners hand craft their finishes from scratch. Hundreds of professionally-formulated finishes are available, delivering varying levels of protection and lustre. But some turners still prefer using their own 'signature' finishes, achieving results that rival any commercial finish. However, few finishing products are specifically made for woodturnings. Much of the application information has been designed with traditional furniture finishing in mind. While some of the procedures for applying a finish to a turning, or a piece of furniture may be the same, others are not. As woodturners, we are fortunate that our lathes can help us finish - a big advantage over furniture makers. The lathe can transform laborious and tedious activities into something fairly quick and simple. I can spin a bowl at a few hundred revs to apply, cut back, or buff a finish - though I wouldn't care to do this with my dining room table! The main drying oils are linseed, soy, tung, castor and tall oil. Linseed oil comes from the seeds of the flax plant (Linum usitatissimum) and is the oldest cultivated plant in Europe. It was used in paint formulas by the Romans. Linseed oil is obtained by various methods, including pre-expelling, followed by hexane extraction of the resulting press cake. The oil is refined to remove phosphatides and gums, which naturally occur in the oil. Subsequent refining through post-desliming with sulfuric acid and phosphoric acid yields an oil with virtually no traces of phosphatides or gums. Further post- treatments include lye neutralization and earth bleaching, which yields a very light drying oil. The natural smell of linseed is removed through vacuum steam distillation. Removing the thin layer of wax that covers each seed is the last stage of the refinement process. Dewaxing is done by cooling the oil to 4 degrees Centigrade. The cooled oil is held at this temperature until the waxes have crystallized. This is then removed by mechanical filtration. Soy oil is obtained from soybeans (Glycine maxima). It's considered a semi-drying oil, unless modified. It is often combined with tung oil in some oil finishes. Soy oil is obtained by cracking and flaking the soybeans, followed by hexane extraction. Tung oil comes from the seed kernels of the tung tree (Aleuritis fordii - Chinese tung oil or Aleuritis cordata, syn. vernica and verrucosa - Japanese tung oil). The main source of raw tung oil is China and South America. The nuts of Aleuritis montana, Aleuritis trisperma (kekuna oil) and A. moluccana or A. triloba (lumbang oil) also produce oils with properties similar to Chinese tung oil. In 1298, Marco Polo reported that tung oil mixed with lime was used for impregnating and sealing wooden ships. As early as 1894, the oil was being imported into Europe and the United States as a substitute for linseed oil. Tung oil is produced by mechanical pressing, or by solvent extraction. The oil obtained is then filtered to remove impurities. Castor oil is obtained by cold pressing and hexane solvent extraction of the beans from Ricinus communis. The oil is then converted to a drying oil by heating with acid catalysts (sulphuric acid, phosphoric acid or acidic salts) to form dehydrated castor oil, which contains conjugated octadecadienoic acid isomers. It ranks between linseed oil and tung oil for film drying and formation characteristics and is frequently used as a base for non-yellowing binders in flexible coatings, due to its lack of trienes. Tall oil is a by-product of the process of producing cellulose from pine trees. It is not technically an oil, but a mix of unsaturated fatty acids, rosin acids and various sap extractives. Tall oil is used in the manufacture of alkyd resins. oil show no marked increase in viscosity when exposed to air. Drying oils are usually sub-divided into three main groups - non-conjugated, conjugated and other oils. Non-conjugated oils, such as linseed, soybean, sunflower and safflower oil, are fatty oils that contain polyunsaturated fatty acids, whose double bonds are separated by at least two single bonds (i.e. isolated double bonds make up the non-conjugated oils). Conjugated oils, such as tung, oiticica, dehydrated castor oil and isomerised non-conjugated oils are polyunsaturated fatty acids whose double bonds are partly or fully conjugated (that is, alternate single and double bonds in the carbon chain are the fatty acids). Other oils include those with multi-functional fatty acids, which get their drying characteristics by chemical conversion, such as raw castor oil and tall oil. A simple way to classify fatty oils is by their iodine value. Drying oils have iodine values above 170, whereas semi-drying oils range between 110 and 170. The place of cultivation and climate can alter the fatty acids in a drying oil. The high amount of linolenic acid in nonconjugated oils, like linseed oil, affects its drying characteristics. High concentrations of linolenic acid can result in rapid drying, yellowing and brittleness. Oils with low or no linolenic acid, like soybean and safflower oil, obtain their drying characteristics from high levels of triglycerides, which contain linoleic acid. The drying of these oils produces flexible films with little yellowing. Conjugated oils like tung oil are much more reactive than non-conjugated varieties. Conjugated double bonds favour polymerisation and oxidation and dry faster than non-conjugated oils, and the film offers a high resistance to yellowing plus greater resistance to water and alkalis. The main drying component in tung oil is eleostearic acid, a conjugated octadecatrienoic acid. The oleic acid in the fatty oils and unsaturated fatty acids plays a small part in the drying process too. The saturated fatty acids present, however, act only as plasticizers. Induction - Through a process known as autocatalysis, the oxygen uptake, which is slow at first, steadily increases. Factors such as temperature, light and heavy metals/inhibitors in the oil affect the overall uptake rate. Initiation - As the film continues to take up oxygen, its mass increases. The double bonds in the film begin to rearrange and polar groups such as hydroxyl and hydroperoxy develop in the film. This leads to the association of molecules, through forces such as hydrogen bonding. Cross-linking - As the number of double bonds in the film begins to diminish, larger molecules form, and volatile and non-volatile carbonyl compounds are generated. The exact chemical reactions, as well as the structure of the film-forming polymers, are not completely understood. The first autoxidation step in non-conjugated oils is de-hydrogenation of the unsaturated fatty acid by molecular oxygen, which forms a radical. This starts a catalytic radical chain reaction that increases with time, leading to the formation of a hydroperoxide. At low levels, the hydroperoxides produced during autoxidation decompose to form free alkoxy and hydroxyl radicals. Higher levels of hydroperoxides form free radicals through biomolecular disproportionation. The resultant free radicals react in various ways to accelerate the autoxidation process. The drying of tung oil varies a lot from linseed oil. Tung oil absorbs about 12% oxygen (compared to linseed's approximate 16%) and quickly forms a surface skin. As less oxygen is absorbed, the oil becomes viscous faster. Unlike the hydroperoxide formation during autoxidation in linseed oil, tung oil forms cyclic peroxides. The methyl eleostearate formed has a higher molecular mass than linoleic acid esters. The direct attack on the double bonds by oxygen forms cyclic peroxides. The resultant reaction of the peroxides with allylic methylene groups, leads to the formation of radicals. This creates a radical chain reaction that forms polymers. The molecular mass created during tung oil polymerisation is less than that achieved through linseed oil polymerisation. To speed up the film formation and curing process, manufacturers add 'driers' to the oils. Driers are oil-soluble metal salts of organic acids. When dissolved in aliphatic or aromatic hydrocarbons, they are called siccatives. When added to drying oils, they are known as boiled oils. Traditionally, driers contained combinations of oil-soluble metal salts like cobalt and/or manganese with zirconium, lead or calcium salts of 2-ethylhexanoic acid or naphtenic acids. Cobalt and manganese salts act as surface driers and aid in the drying of the film on the surface, where oxygen concentrations are highest. Lead and zirconium salts catalyse throughout the film and are known as through driers. To avoid using lead, which is highly toxic, modern siccatives use cobalt and zirconium blends. This combination reduces surface drying speed and promotes even drying throughout the substrate. Calcium salts are sometimes used as well, mainly to reduce the amounts of other driers that may be needed. Various other compounds may also be present in some siccatives, including beryllium, cadmium and nickel. to 320 degrees Centigrade and conjugated oils to 240 degrees Centigrade. This increase in viscosity, or 'body', is caused from thermal decomposition of naturally-occurring hydroperoxides. This decomposition yields free radicals that contribute to a limited amount of cross-linking. Tung oil heating must be carefully controlled, or the polymerisation will lead to gelation of the oil. The viscosity can also be increased by passing air through the oil (called blown oils) at high temperatures - up to 150 degrees Centigrade. Reactions like those seen in crosslinking cause oligomerization of the oil. Polymerised tung and linseed oils dry faster, and are harder and more durable than raw oils. They also produce a smooth, glossy finish, whereas raw oils produce a matt sheen, a result of the natural expansion that takes place during polymerisation. This expansion creates a finely-textured surface that appears to the naked eye as a matt finish. Some highly-specialized polymerised tung oils are processed at extremely high pressures and temperatures. These are called thermalized tung oils and are used to make nitro-cellulose lacquers. This process improves the drying, hardness and lustre of the oil. Raw linseed oil is linseed oil that has been extracted and packaged without any additives. It takes much longer to dry than boiled linseed oil. The former needs several weeks to cure, against 36-48 hours for the latter. Boiled linseed oil has been altered by adding chemical drying accelerators, that is solvents and siccatives/driers. This treatment allows the manufacturer to reduce the volatile organic compounds (VOC) content, while keeping the viscosity. Boiled linseed oil is often mixed with 10-15% stand oil. Stand oils are drying oils with increased viscosity, produced by heating the oil without oxygen. To increase the viscosity of the boiled oil, air is sometimes 'blown' through the oil at 60-100 degrees Centigrade. Blown linseed oils are polymerised by oxidation to increase the viscosity and acid number. They are used in non-penetrating finishes and dry faster than heat-bodied linseed oils. the drying, enol tautomers can react with trace amounts of atmospheric ammonia. This produces a substituted pyrrole, which can be converted into a coloured product by oxidation, or by condensation in the presence of formic acid. Coloured metal siccatives can also contribute to the discoloration and/or yellowing of linseed oil. To alleviate the yellowing, saturated aliphatic aldehydes may be added to the oil. There are four main groups of modern 'oil' finishes: unblended, or pure oils; polymerised oils; standard varnishes; and blended oil/varnish mixtures. Unblended oils typically include oils extracted from plants, nuts or petroleum. They include raw and boiled linseed oil, tung oil, kukui nut oil, macadamia nut oil and walnut oil. The labelling should include the words 'pure' or '100 per cent', or the oil may have been blended with other ingredients. Tung oil is sometimes called China wood oil. Polymerised oils have been sufficiently heated in an oxygen-free atmosphere to cause thermal polymerisation, but not enough to cause gelation. The oil can be very viscous, and is best applied in very thin layers. Two types of commonly-available polymerised oils are linseed and tung. These specially-processed oils dry faster and are harder-cured films, with a more durable, glossy lustre. Polymerised oil finishes are more expensive than standard ones. In a production environment, polymerised oils allow a significantly faster build, saving time and labour. Standard varnishes include modern varnishes and polyurethanes, which are thinned with petroleum distillates until they reach viscosities where they can be applied. Some are thin enough to be wiped on, like a typical oil finish. These are really wipe-on or wiping varnishes, but are usually marketed as 'oil' finishes. Thicker varnishes are made to be brushed on, but many can also be wiped on with hand or high-speed methods. Varnishes are made by heating drying or semi-drying oils like linseed, tung, soybean or safflower at high temperatures with natural or synthetic resins, until the proper viscosity is achieved. The varnish is then thinned with hydrocarbon solvents to reach application viscosity. Natural resins used may include congo, copal, manila, amber, damar and kauri resins and others. Synthetic resins may include ester gum, phenolic resins, alkyd, polyurethane or coumarone-iodine resins. Today, natural resins are seldom used - largely replaced with synthetics in most varnishes. Blended oil/ varnishes are just that - blends of oils and varnishes. The ratio of oil to varnish, as well as the specific oils or varnishes used, determines the physical characteristics of the final finish. Oils extend the curing time and soften the lustre and hardness of the final finish. Varnishes increase the 'body' of the finish and provide increased hardness, lustre, water resistance and scratch protection. In the next part, I'll tell you how to achieve better oil finishes. All the bowls shown here were made by Steven Russell.